German publisher flaregames has announced at Casual Connect Europe 2016 that its latest partnership is with Finnish startup Kopla Games, signing up the Tampere firm's debut game Project Nonstop. The six-strong Kopla Games was set up in 2015 by four former Rovio developers with the mission to "introduce action RPGs to everyone." Billed as a never-ending RPG, playable with one hand and optimised for on-the-go gameplay, Project Nonstop (working title) joins Emerald City's Lionheart and Limbic's Zombie Gunship Inc. in flaregames' fast-growing roster. “What immediately struck us about Project Nonstop was its unique concept and the ease with which a player can jump into quick-fire play sessions," said flaregames CEO Klaas Kersting. 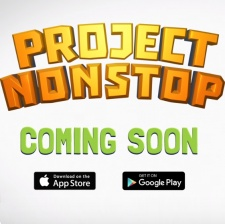 True to his firm's aforementioned mission statement, Kopla Games CEO Mika Kuusisto emphasised that Project Nonstop is a role-playing game that can appeal to anyone. “There are many companies releasing action RPGs for mobile, yet there is a gap in the market for such an adventure that resonates with a much broader audience,” he said.